In 1970, Sun Ra and his Intergalactic Infinity Arkestra released its strange, mind melting jazz masterpiece The Night Of The Purple Moon. 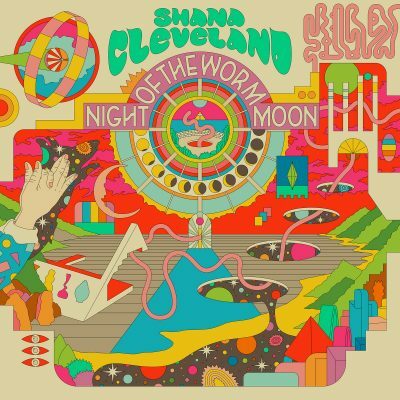 Forty-nine years later, Shana Cleveland takes the strangeness a step further—and weirder. Night Of The Worm Moon was recorded during the solar eclipse of 2018 (of course). Worm Moon is a sleepy cocktail of songs that kicks in at that place between wakefulness and sleep where the subconscious takes over and shuffles everything haphazardly around. Taking a break from her brilliant surf-rock group, La Luz, and going off the beaten path from her other project, The Sandcastles—Cleveland has released a slow rolling, hypnotic, acoustic beauty of a record. Night Of The Worm Moon silently explodes and blossoms out like a magical cosmic flower, arriving just in time for the Spring Equinox. Worm Moon sports the same surfy vibe found in La Luz, however, it’s slowed down and seen through a thicker gauze. Cleveland expertly creates complicated fever dreams comprised of vast and lonely science fiction landscapes, UFOs, strange creatures, insects and other dimensions. Cleveland also lets in slivers of love that creep in, out and all around these hallucinatory worlds. On the last track of the record, “I’ll Never Know,” Cleveland announces what I already know: “I’m getting weirder all the time.” The album is stuffed full of Cleveland’s weirdness—it all works. Cleveland cocoons everything into a perfect, psychedelic-swirled universe. It’s a universe I never want to leave. Worm Moon is a cool breeze of a record packed tight. It’s like ice cream—with each song I feel like I have to lap it all up before it all melts away. Other songs fold out about love in other dimensions, “In Another Real,” UFOs in “Fireball” and the beautifully, bizarro, “Invisible When The Sun Leaves.” Cleveland also manages to sneak in two instrumental tracks with “Castle Milk” and “Solar Creep.” These songs come at the right time to give the mind a slight reprieve from Cleveland’s wonderful stories. Cleveland brought in a handful of friends to casually contribute to her vision: Will Sprott (multiple instruments), Abbey Blackwell (bass), Olie Eshelman (guitars) and Kristian Gerrard (drums).